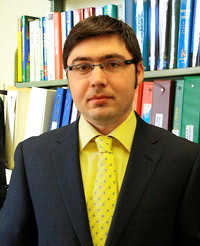 Dr. Razvan Pascalau joined the School of Business and Economics at SUNY Plattsburgh in fall 2008. He graduated with a Ph.D. in Economics and M.Sc. in Finance from the University of Alabama. He also holds an M.Sc. in Financial and Foreign Exchange Markets from the Doctoral School of Finance and Banking in Bucharest, Romania. In 2004, he worked full time for the Ministry of Finance in Romania as a Counselor of European Integration. His primary field of interest is (applied) time series econometrics with an emphasis on modeling nonlinear structures in macro and financial data. His research interests also include topics related to financial risk management, international finance, and managerial finance/economics.